Installation of Hybrid-Resin products is just as easy as working with wood products. Why is that? Because all of our Hybrid Moldings are made from Hardwood and Resin. We are the only manufacturer in the world using this blend of materials. Hybrid-Resin products are consistent in their density without knots or surprises that make cutting wood sometimes difficult. Nailing, cutting and gluing any of our products can be performed with all STANDARD WOODWORKING TOOLS & GLUES. Pneumatic nail guns are used extensively at Pearlworks during Research and Development. We recommend micro-pinners because of their very fine headless nails, which virtually eliminates filling holes and greatly reduces any splitting when nailing the more delicate parts in our catalog. Some installations may require screws to be used. All holes can be filled with standard wood putty or bondo. Resin products can be applied to any material using standard wood glues and adhesives. Drying times and the amount of glue used is the same as with wood. We recommend Tite-Bond II waterproof wood glue. Our research and development department has tested numerous glues and adhesives during our development of new products and has not found a better or more economical wood glue for the money. If any of your installations require a stronger bond, we recommend any of the commercially available wood floor adhesives. All Flex Moulding Can be Used "On Edge"
Finishing Hybrid moldings or all resin flex moldings from Pearlworks is easier than staining wood moldings. Any good finisher will always seal the wood before staining. Why is that you ask? Because wood is a porous material with different densities. This difference makes wood absorb stain in an uneven manner. This process gives a nice even color over the entire project without any blotchiness. Resin is a Non-Porous material. It does not absorb stain like wood, it lays evenly on top of the surface giving a nice even color. The steps listed below briefly explain basic wood staining techniques. Clean material with acetone or paint thinner before applying any coat. Apply a transparent tinted base coat. This can be lacquer or water based. All base colors are tinted using universal tint colors. This base coat can be thinned if you desire a more transparent look, or applied unthinned for a more opaque look. Apply a coat of Glaze that has been tinted to a desired color. (Red, brown, light brown...) This glaze coat gives the corbel its base color. Spray a sealer coat... It is now ready for Dry-brushing or another glaze coat of a darker color. Dry-Brushing is now applied by using a mix of Raw Umber tint (90%) mixed with Glaze (10%). This technique as you can see highlights and enhances the detail of the corbel. 1) Check thickness of resin flex moulding to wood being matched to. It may be necessary to shim or plane either product to have material properly line-up. 2) Screws work better than large nails. Pre-drill all screw holes first to prevent cracking. Install screws where they can't be seen or easily covered. 3) Cut and match outside corners first, let the inside corners end where they may. 4) Do not over-nail or over-stress material. 5) Use construction adhesive along with pre drilling and screws. Pneumatic nails are recommended for installation of flex-resin crown. If pneumatic nail guns are used, only use pin nailers using the smallest diameter nail as possible (18 gauge or 23 gauge pinners). Nails should only be used to hold material until adhesive cures. 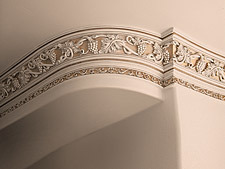 6) Pearlworks Crown Mouldings are specifically designed with deep carving and ornate detail. It is very difficult to match all patterns in every case. Don't worry on outside and inside intersections the pattern match can be improved by trimming the pattern with a utility knife. This technique is used extensively with great success. 7) All flex moulding should be kept as warm as possible. The warmer the material the more flexible it becomes, which aids in any splitting from nails and screws that may occur. All Radius Mouldings require a customer-supplied template. 1) The following procedures will aid in installation of Pearlworks products. When handling the Flex Moulding it is recommended you support the product with both hands to avoid any stress fractures or possible breakage. Any extreme bending may result in an unwanted stress fracture. 2) All Pearlworks products can be stained or painted with equal base. Our hardwood maple hybrid Mouldings can be stained using any product that would be used on wood. 4) Proper cleaning with acetone or lacquer thinner should be used before any staining or painting is performed. If this basic cleaning step is avoided lifting and peeling of your finish could occur. Any type of paint can be used, oil or water base. 5) Any wood-glue, construction adhesive, or super glue (Gel form) Along with nailing is an excellent way to apply material. Tape or clamps can also be used to hold material in place until adhesive cures. DO NOT OVERNAIL! 6) Pneumatic pin nailers can be used to apply material, use the smallest diameter nail as possible. When nailing delicate ornamentation we recommend the use of 23 gauge pneumatic pin nail guns. Such as the Senco SHP-10. We have used this size nail gun exclusively on all of our material. 7) Do not over nail! Nailing should be spaced a minimum of 10 inches apart and 3/8 inches from any edge. 8) Pre-drilling is recommended if wood-screws are to be used. 9) Do not use staple guns. 10) Do not over stress material. 11) All Pearlworks ornamentation can be cut, sanded or shaped using standard wood working tools. 12) Material should be kept between 60-80 Degrees F. If material is stored below 60 F, then the flexing of the material could break it. 13) Lay Flex Mouldings or ornament flat in the sun or under a heating blanket on the job-site. The warmer the material, the more flexible it becomes, splitting is greatly reduced. 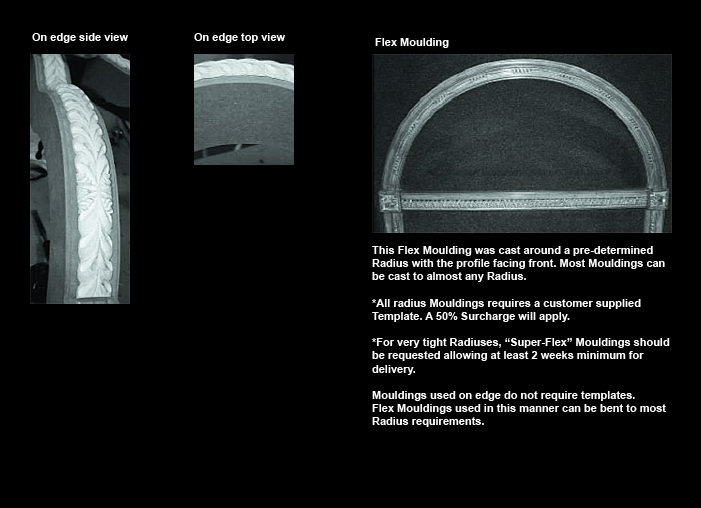 All Flex Moulding is subject to a 50% Radius surcharge add on for custom Radius Mouldings. Any Moulding requested in Super-Flex is subject to a 25% Surcharge. 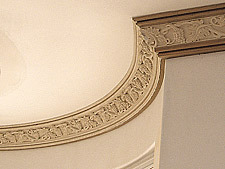 Super-Flex Moulding is also considered custom pieces. They are subject to custom order policies. (Non-Refundable and 100% pre-payment.) Shown are MLD-182, MLD-183, MLD-184 & MLD-185, a 10% surcharge will apply for these Mouldings. Flex crown mouldings have a limit on flexibility determined by the moulding width. 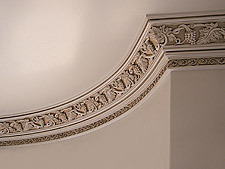 We have listed the tightest recommended radius for each width of crown moulding. We do not recommend flexing any of the crown mouldings beyond its minimum radius listing or splitting and stress cracks can occur. The minimum radiuses for flex crown mouldings are determined by width, thickness and angle of back cut (typically 45 degrees) of the moulding. The formula for determining the minimum radius for crown moulding is 3.2-4.0 x moulding width. This formula is intended as a guideline only. There are many variables that must be taken into consideration when doing radius crowns. Typically the larger crowns (10" & 12") have less room for error. We intentionally design our mouldings on the thick side so that they have less tendency to dent where they are attached to a ceiling and wall, producing smoother radius with less dimpling. We do not recommend flexing any of the crown mouldings beyond its minimum radius limits, otherwise splitting and stress cracks can occur. If a customer chooses to exceed the limits of the recommended radii, Pearlworks will not accept any responsibility for any and all problems that may occur. 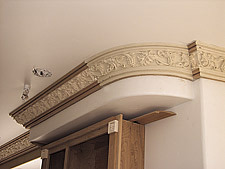 When ordering flex crown moulding, you must specify if it is for an inside curve wall, or an outside curve wall.